A phenomenal red with aromas of blackberry, licorice, sandalwood and hot stones turns to cigar box and hints of sweet tea. Full body, with incredible depth and concentration yet agile and playful. Long and fascinating. It talks to you. Balanced. The greatest Seña ever. The Wine Advocate - The 2012 Sena is from a cool vineyard on a rocky hillside with some clay, in the middle of the Aconcagua Valley, where there is still some influence from the Pacific Ocean. This wine has always been a blend, and in 2012 it is half Cabernet Sauvignon, complemented by Carmenere, Merlot, Malbec and Cabernet Franc. Bright and focused, with a nose mixing red fruit, it is also bright-colored, with ripe black fruit and balsamic notes in the shape of tobacco and cedar wood, with a medium-bodied palate, very good freshness and acidity, sophisticated, polished and fine-grained tannins. This is still a baby, but the silky texture makes it accessible now, while the complexity should come with more time. Drink 2015-2022. Suckling - A phenomenal red with aromas of blackberry, licorice, sandalwood and hot stones turns to cigar box and hints of sweet tea. Full body, with incredible depth and concentration yet agile and playful. Long and fascinating. It talks to you. 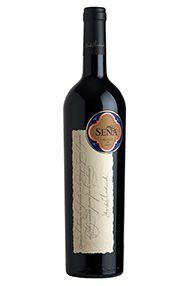 Seña was originally a joint venture between Eduardo Chadwick and Robert Mondavi with the aim to produce Chile's ultimate premium red wine. Sharing their dreams, efforts, and dedication, in 1997 they released the first vintage of Seña (1995), Chile's first Icon wine, which marked a milestone and initiated the path for making Ultra Premium wines in Chile. The fruit for Seña is sourced mainly from biodynamically farmed, premium plots in the Aconcagua wine region. The blend varies with the vintage but is typically comprised of 50% Cabernet Sauvignon, 20% Malbec and 15% Cabernet Franc and a little bit of Petit Verdot. The grapes are fermented in temperature-controlled, stainless steel tanks and the wine is then matured in small oak barrels (75% new) for 22 months. The first couple of vintages have been enthusiastically received by critics and connoisseurs alike, with comparisons already being made with some of world's top Cabernet blends. The future for Seña looks very promising. Aconcagua, 80km from the capital Santiago, north of Casablanca and south of Limari, is the last east-west tranversal valley before the long, north-south Central Valley begins. It is named after the highest peak in the Andes, Mt. Aconcagua (6,959m) and is made up of two very distinct zones. The interior of Aconcagua, Panquehue, is Chile's hottest, driest wine region, while the new vineyards located closer to the Pacific coast produce wines with pronounced exotic flavours. Pure Andean water, a stable climate, clear skies and low risk of frost create ideal conditions for wine growing. 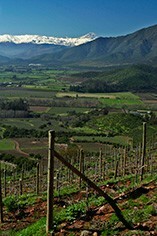 Cool currents from both the Pacific Ocean and the snow-capped Andes Mountains help to maintain good acidity in the grapes, while the sunny and intensely hot summers ensure full levels of fruit ripeness. Cabernet Sauvignon and Carmenere dominate the production and they have been grown here since the mid 19th century, yet since the 1990s the region has witnessed an enthusiastic interest in Syrah.